I’ve written recently about the gross abuse of statistics by the DWP and by Grant Shapps on behalf of the government, which led to public rebukes by Andrew Dilnot, the Chair of the UK Statistics Authority. This is not aberrant behaviour. The Tory party has a strong track record of statistical distortion and even outright lies. David Cameron lied to Parliament last year about new private sector jobs created under his government (an offence that used to lead to automatic resignation if discovered). Last week, he was at it again. Robert Flello (Stoke-on-Trent South) (Lab): Yet again we have no answers from the Prime Minister, who blames everyone but himself and denies that there is a crisis in A and E. Let me give him one more chance to try to give an answer. Why does he not admit what everyone in the health service knows—his £3 billion reorganisation has diverted attention and resources from patient care and he has betrayed his promises? May we now have an answer? The Prime Minister: The abolition of the bureaucracy that this Government have brought about will put billions of pounds extra into the NHS, but the point that the hon. Gentleman has to take on is that this Government made a decision, which was not to cut the NHS. We are putting £12.7 billion extra into the NHS. he [Dilnot] said the UKSA‘s calculations were based on what he considered “the most authoritative source” of national statistics on the subject – the Treasury’s Public Spending Statistics publication. “On the basis of these figures, we would conclude that expenditure on the NHS in real terms was lower in 2011-12 than it was in 2009-10,” he said. When the £12 billion claim first reared its head, it was challenged robustly by BBC Politics Show host Andrew Neil. Interviewed after his speech to the Conservative party conference last autumn, Jeremy Hunt tried to claim that the Tories had put this extra money into the NHS. Neil, to his credit, shot back that this was “pure propaganda” – and revealed that the funding increase was £60 million – far less than matching inflation, and therefore a substantial real-terms decrease. But the truth about NHS spending under this government doesn’t end there. A huge amount of the money that the coalition puts into the NHS simply goes in the front door and straight out the back. As I reported last year, in the 2011/12 fiscal year, the Treasury ‘clawed back’ no less than £1.4 billion from NHS funds, while siphoning off another £1.5bn for other uses – dwarfing the paltry increase in budgeted funds. But it gets worse. The clawback for the 2012/13 year was even higher – at £2.2 billion. The reality of the NHS funding situation is no secret, and is certainly not something that Cameron could claim to be in ignorance of or that it slipped his mind. No matter which way you cut it, Cameron – knowingly – lied to the House and should resign immediately, were it not that such things are more likely to lead to promotion than to resignation under this government, as Jeremy Hunt’s case showed last year. Not only that, but he repeated a lie that he’s already been rebuked about and told not to repeat. Looking at Treasury spending statistics, I see a nominal, but not real-terms, increase in NHS spending compared to the last year under the previous government, but certainly nothing like £12.7 billion. Since the Treasury routinely claws back well billions from the NHS – some £2.2 billion during 2012/13, up from £1.5bn in 2011/12 – Mr Cameron’s statement was a bald lie. He did not say that NHS budgets had increased, but that more was “put into” the NHS – which is not true when the Treasury is clawing back far more than the nominal increase. And even if this were not the case, budgets have not risen by £12.7 billion – or at all in real terms according to yourself late last year. Since you have been so good as to rebuke the government over false statistical claims on at least a couple of occasions this year, please would you take a look at this matter and do so again? Can I ask you to do the same, to make sure that this issue receives the attention – and eventually the public rebuke – that it deserves? If you want to send your own complaint to the UKSA, the email address is authority.enquiries@statistics.gsi.gov.uk. You might want to copy it to your MP, too – a complaint from Sheila Gilmore MP to Andrew Dilnot led to the rebuke on ESA benefit lies, so some MPs do pay attention to such things and take action. If you want to find your MPs details, you can look them up very quickly at www.theyworkforyou.com. Jump in and let’s turn up the heat on Walter Mitty David Cameron for his persistent, arrogant lies! So that’s Cameron, LieDS, Shapps (if that’s what he’s calling himself today), Jeremy Misprint Hunt – all guilty of lying to Parliament, which is contempt of Parliament, as revealed on Voc Political a few weeks ago. Perhaps, besides writing to the UKSA, we should write to the Speaker and the Standards Committee and ask why they’re turning a blind eye to it. Lies,damn lies and Tory lies. The entire government are a bunch of liars! It is also often said or implied that the NHS is somehow exempt from “austerity” which is impacting on other government departments. Given demography and advances (which may be good for, or save society money but cost in the NHS budget) it is said that inflation + 4% keeps the NHS afloat (more if you want to invest). If the actual spend is less than inflation and subject to additional clawback then the “pain” for the NHS (and it’s staff) may be 6% per year in terms of what can now be offered, or call it 3% if we all manage a 3% CIP (Cost Improvement Programme – increasingly difficult). Compound that for 5 years and it’s about 20% – entirely in keeping with the £20 bn (of a £100 bn budget) “Nicholson Challenge” – the challenge being “can you chaps do the expected increase in health activity for 20% less than you had before?”. Well we’ll all do our best, even though we’re in a torrent of “creative destruction” but please don’t insult me by suggesting that we are somehow not in the same boat as all the other public services (while trying to heavily imply to patients that we’re not) and indeed the private sector (where applicable in the economy). It feels like cuts because it is cuts. I love a bit of righteous indignation – we need more of it, more widely! I will certainly write to Dilnott and my MP over this. It may be worth writing to some of the churches who’ve themselves written to Cameron (7th June) to demand an apology for misrepresentation of statistics by IDS(S) and Shapps. Eyes to the right, nose to the left! A very parliamentary picture: eyes to the right, nose to the left! Just one of many examples (and probably the most accurate, though that’s not saying much) of reporting of the police investigation that’s on-going into MSFT. Count the assumptions and inaccuracies! I can hardly believe it but David Cameron has just repeated his claim that the Coalition are ‘putting £12.7 billion EXTRA into the NHS’ not once but twice, during today’s Prime Minister’s Questions!! He also claimed that £3.6 million of that was going to NW London hospitals. my email. Lets hope Mr Dilnot does something about this soon. Thank you for spotting this – haven’t been able to listen to PMQs yet. I’m going to send another email to Andrew Dilnot – perhaps you could too? Will do, Steve. This has got to stop. In the run-up to the General Election, Cameron and co have been repeatedly claiming that they put more money into the NHS every year they have been in government. It is a bare-faced lie – and one they were publicly spanked for by the UK Statistics Authority when they were in government, as even the Daily Torygraph reported. But that won’t stop them claiming it in a desperate attempt to nullify Labour’s justified position as the creators and defenders of the NHS. Did Shapps Grant Boris a wish too? Is Grant Shapps just the fall guy to distract us while the desperate Tories quietly use ‘Michael Green’ to implement a widespread editing whitewash across Wikipedia before the election..?! For example, isn’t it rather hard to believe that the Boris Johnson entry would suddenly ‘benefit’ from over 120 changes during April? Are they all likely just to be innocuous editorial “tidying up” changes, pre-May? It included, for example, an ‘Ancestry’ section containing the family tree, with Turkish family links etc. 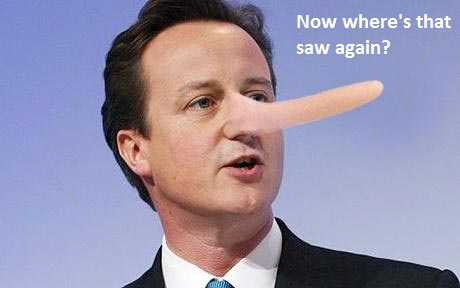 Are we becoming paranoid about Tory lies – or just too used to them all? World-record late comment in relation to the last line of ideb8. I have noticed a tendency amongst higher management (pay > 140k say) and politicians to lie so frequently that you wonder whether they simply don’t realise they’re doing it.